Today was the first day of school! 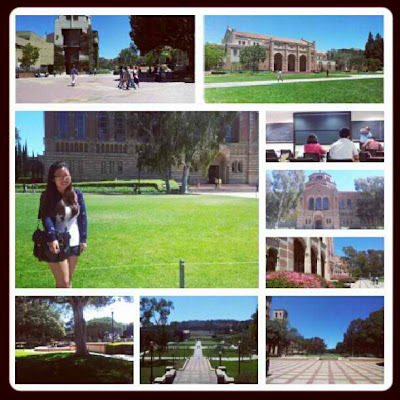 UCLA is a pretty pretty campus! Flowers everywhere! NTU should plant more flowers! And I hope I'm making sense now cause we just had alcohol lols! Joy KO already and amelia went to bath. I've got nth to do now. Feeling so sleepy now and tomorrow's lesson is in the morning! After that I started pouring more mixer lols. Had worst drinking experience before - drinking and sleeping at a random void deck hahas. Luckily I had a friend to look after me then. But that was cause I drank on empty stomach! I've got so many things I haven't blogged about! Must find time to write all the blog posts already. And I just realised I have no idea what time zone this blog is using! Should be Singapore timezone. But when I say today it's Los Angeles 25th June! In SG it should be 26th June already?